"Be tolerant of THE SKIPPER who disagrees with you... 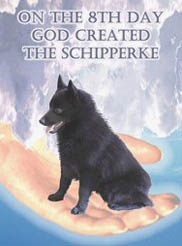 The Schipperke has a right to his Ridiculous Opinion." Albuquerque is nestled beside the Rio Grande River. An aerial view shown below shows a slightly greener area alongside the river known as the Bosque. There are no buildings alowed in the Bosque all through the state of New Mexico. It is a beautiful stretch of 'green' land through desert and mountains. This week's fire area is shown in red. 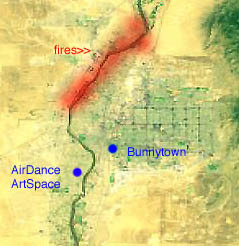 Also noted is the location of the AirDance ArtSpace and Bunnytown (also HQ for Freshchaos and Skippertown). I-25 and I-40 cross at what is called The Big I in the middle of the city. A lot of folks 'pass through' Albuquerque on their way north, south, east, or west making it uniquely a ZIA sort of town in a ZIA sort of Enchanted Land. You just gotta love those 's!!! National news would have you believe that all of Albuquerque has been evacuated due to fires in our river (the Rio Grande) woodlands. Truth be told, our buddy Homer sez that all is well in the Albuquerque environs following two nights of fires in the 'Bosque'. Many dead trees and changed river walk vistas but no lives lost or hurt. 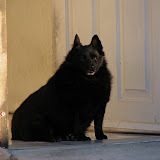 We are happy to report to our friends outside of the high desert, that the bunnies of Bunnytown, the schipperkes of Skippertown, and all the folks at FreshChaos HQ are alive and well. The AirDance ArtSpace is also safe and sound. Ah ... she looks so sweet! Those big, innocent eyes and that cute rear-end just a-wigglin' away. But don't be fooled by that adorable, puppyish face or small stature. When it comes to Miss Mellie, looks are most definitely deceiving. 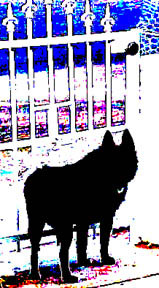 Recently, a new friend and dog lover told us that dogs are responsible for more bird deaths than cats. We were skeptical, until this morning when Miss Mellie cornered a beautiful purple finch and then caught it in flight as it tried in vain to make its escape. At least death by Mellie is quick. Horrible as the event was, I must admit I was impressed that those little legs can get that dog airborne! Happy Solstice to one and all...Aaaahhhh...summer. Finding Nemo. It is the kidz move-eye for adults. A great story and absolutely amazing on the big scream. When you live in the desert any movie that lets you go snorkling with reef fish is a pleasant summer respite. "Just to Be is a Blessing; just to Live is Holy"